Valletta-Malta ...we could only imagine the mix of discoveries awaiting us in this city interwoven with the historical exploits of the noble Knights of Malta. It was like a time capsule into a checkered past of those valiant souls. This fact evoked compelling reasons to linger and savor each new morsel of history. Valletta (population of about 7,000) dates from Stone Age temples, to the coming of the Romans and Arabs, then to the rule of the Knights and the ensuing Crusades, ending with WWII inflicting a horrific raining of bombs upon them. 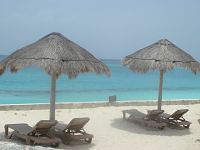 Now an independent republic, the three small islands that make up the Republic of Malta (Malta, Gozo, Comino) are positioned strategically just south of Sicily, an area that has access not only to Europe but to Northern Africa and the Middle East. The sea lanes converge on Malta, the largest island, in a harbor where Phoenician traders arrived 3000 years ago …then the Knights of Malta journeyed there to protect pilgrims on the way to the Holy Land during the Crusades…and now the arrivals are cruise ships. This mooring area is the Barriera Wharf. 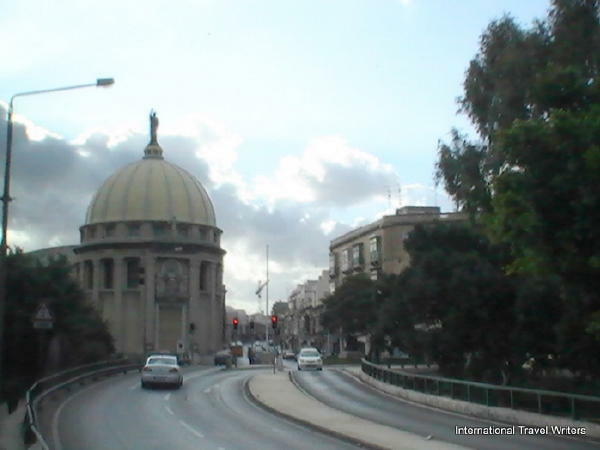 The Maltese language is the only Arabic root language written with Roman characters. 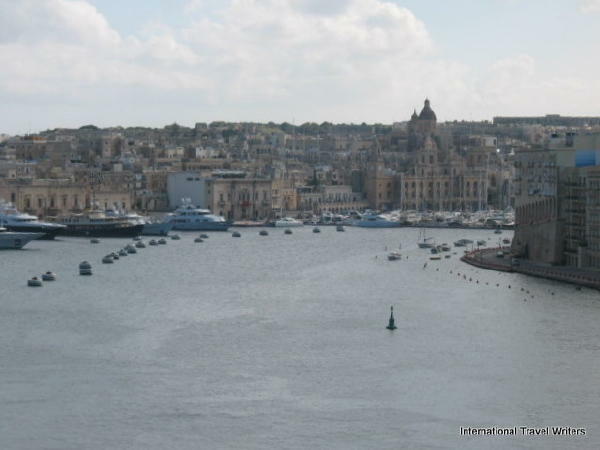 The Valletta-Malta peninsula has two natural harbors, Marsamxett and the Grand Harbor. Guarding the approaches to both harbors is Fort St. Elmo. The Grand Harbor is Malta’s major port and the unloading quays are at Marsa. 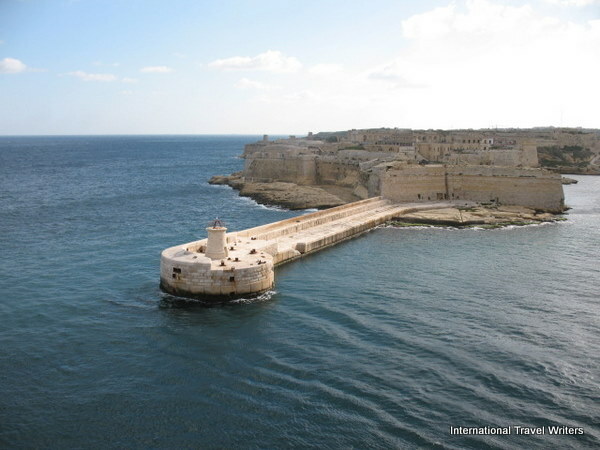 The cruise liner terminal is along the old seawall of the Valletta Waterfront. 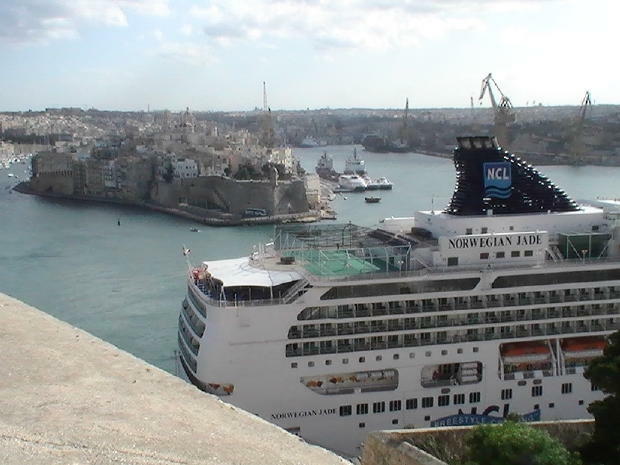 We left our ship, the Norwegian Jade, for our exploration of Valetta-Malta. The captivating history punctuated by different rulers was intriguing. The city dates back to 1566 when its cornerstone was laid by the Grandmaster of the Order of Saint John, Jean Parisisot de la Vallette. The city assumed a strong military presence with thick city walls, an imposing fort, and other burgeoning fortifications throughout the city. 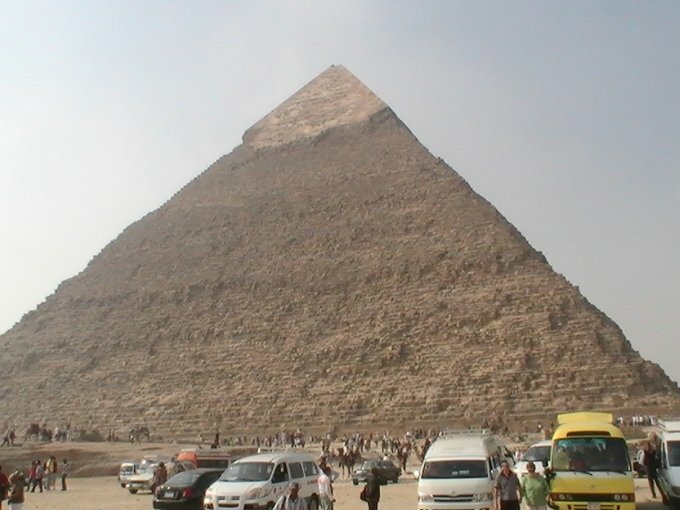 Many of these survived heavy bombing during World War II. Malta was the most heavily bombed place on earth in WWII. During March & April of 1942 alone, the tonnage of bombs dropped on Malta (6700 tons of bombs) was twice that dropped on London in the entire worst year of the blitz. I don't even like the sound of thunder so mentally incubating this image, with the staccato of bombs bursting nearby, conjured up visions of hell. (Ruins are seen below). Below are the southern ramparts which are to the left of the gun battery. The cannons are now a saluting battery although in times past they performed the function of defending the island. Valletta-Malta owes its existence to the Knights of St. John, who planned the city as a refuge to care for injured soldiers and pilgrims during the Crusades in the 16th century. 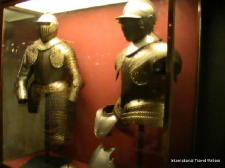 In 1528, Charles V of Spain granted the island of Malta to the Knights of the Order of St. John. 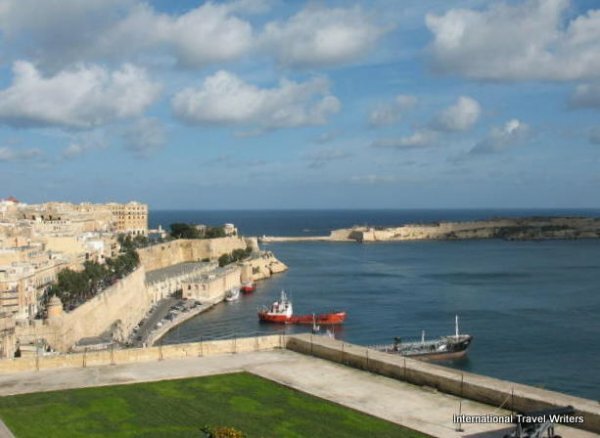 Valletta-Malta stands on Mount Sceberras and lies between two natural harbors. Until the Knights arrived it was simply a dry, barren patch of land. No buildings stood on its bare rocks except for a small watch tower, called St. Elmo, which was located at its extreme end. 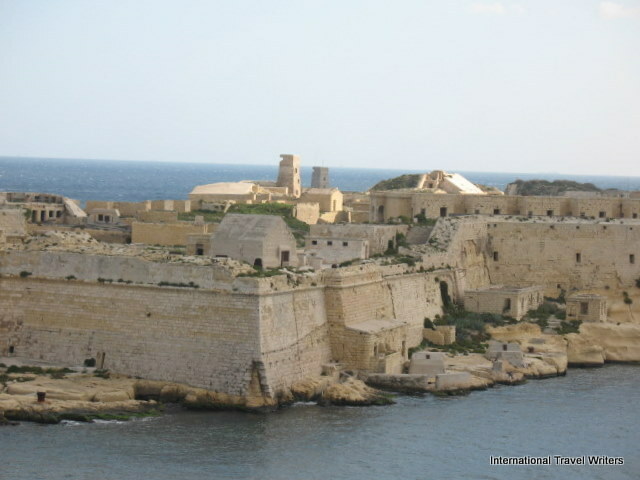 Grand Master La Valette, the gallant hero of the Great Siege of 1565, knew that if the Knights were to maintain a hold on Malta it had to have fortified defenses. He promptly built the well planned new city with strong bastions and deep moats. It soon became a bulwark of significant strategic importance. 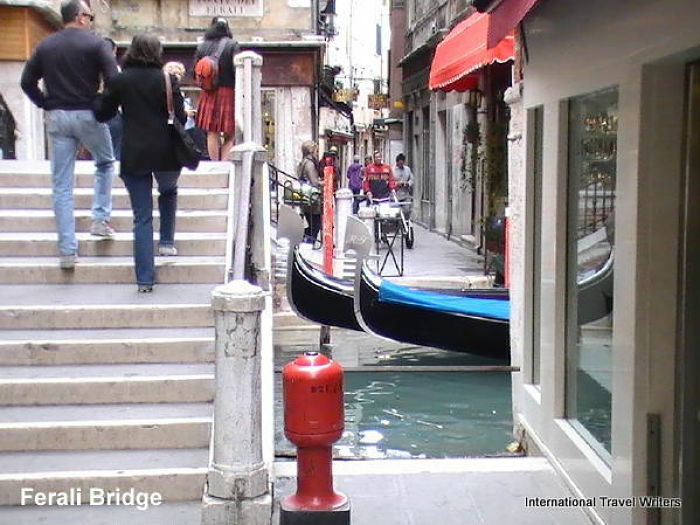 You will notice as you walk down the stairs in some streets (as well as buildings) that the stairs do not conform to normal dimensions because they were constructed to allow knights in heavy armor to be able to climb or descend the steps with greater ease. A short drive took us around the bastions of Valetta-Malta, past Fort St. Elmo and views of Fort Mancel & Marsamxett Harbor. After a complete morning of visiting historical sites and learning some of the background from our tour guide, we would have lunch. 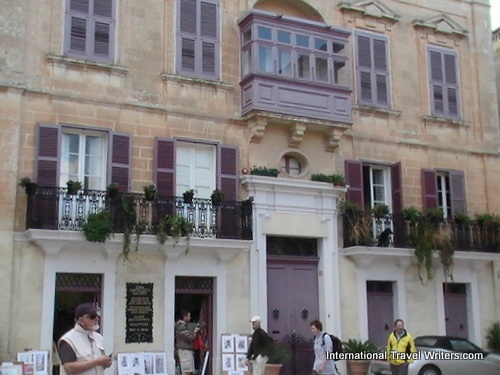 Then the plan was to head to the medieval city of Mdina. 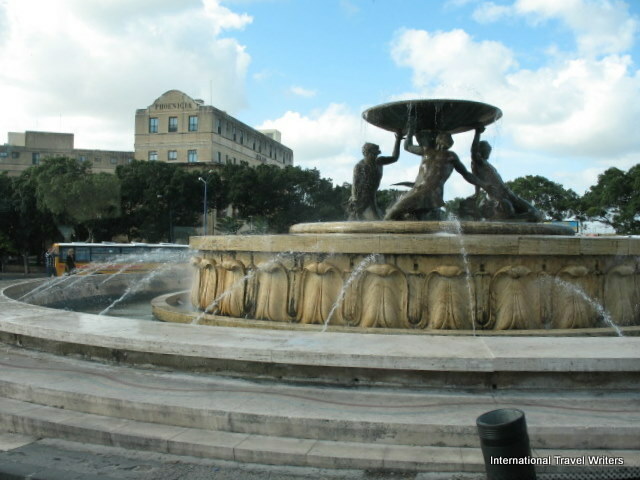 We were let off at the Triton Fountain (see below) which is just outside the City Gate Victoria in the center of the Valletta-Malta main bus terminus. The fountain is surrounded by shops and cafes. I found it amusing to see a Burger King on the ground floor, inside a nearby building. We then took a short stroll to the Upper Barracca Gardens, where the knights once exercised. Built on top of a demi-bastion, we were treated to panoramic views of the Valletta-Malta natural harbors and historical cities across the water of Senglea, Cospicua & Vittoriosa. From this vantage point, with such scenes in front you, it was easy to let your mind’s eye jump back in time and feel the dynamic era of the Knights on snorting steeds. I don't know if they had horses for the Knights on Malta but that was the vision in my head. The flags of Malta were fluttering in the breeze nearby the cannons as they had centuries ago when held by the Knights as they prepared to do battle. The vantage point offers a stunning view of the Grand Harbor. 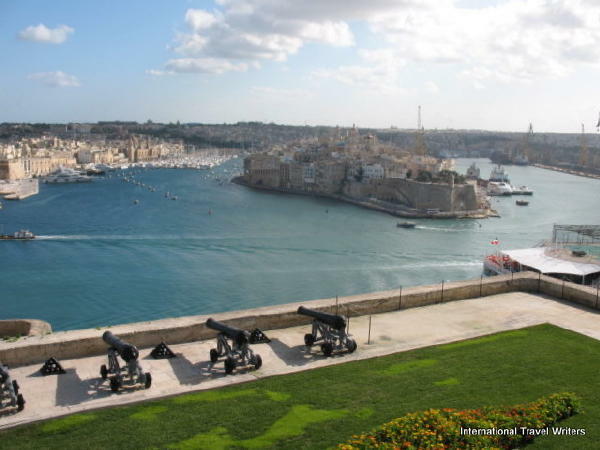 Above is the view over the battery to Vittoriosa on the left and Senglea on the right. 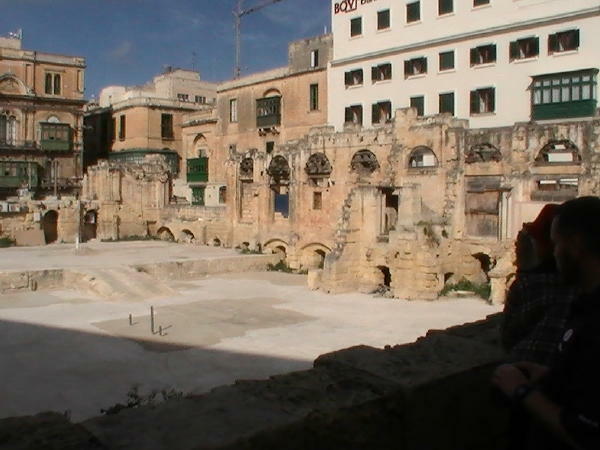 The next visit was to St. John’s Co-Cathedral, formerly the conventional church of the Knights of Malta. On the south side of Great Siege Square, this Cathedral’s façade is flanked by two square Renaissance towers and ancient clocks showing year, month and day. Something in the mix of discoveries that I hadn’t noticed before was the set of unique dual clocks on St. John’s Co-Cathedral. One clock is for the actual time and the other is for the month. They were amazingly accurate considering the age of these timepieces. This set of clocks in Valletta-Malta differed from the set of clocks in Mdina in that both clocks were on one side here, unlike St. Paul's Cathedral in Mdina where one was on the left side and the other on the right side. This Valletta-Malta church is actually the first complete example of high Baroque anywhere and it epitomizes the spiritual and military role of its patrons. 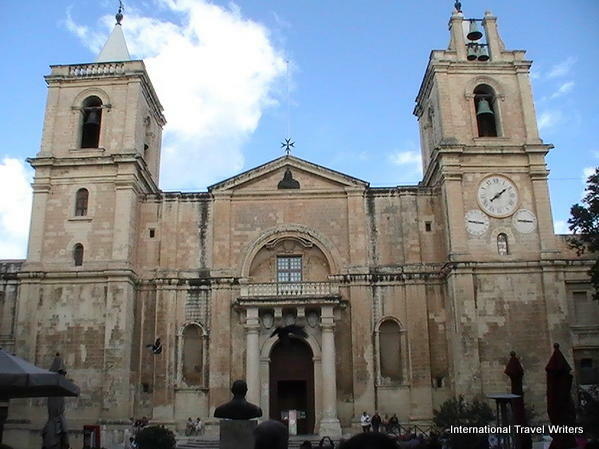 This church houses the Michelangelo Merisi da Caravaggio masterpiece, the Beheading of St. John. It is the only signed work and it’s also the largest painting ever done by Caravaggio, measuring 12 feet by 17 feet which had been commissioned by the Grand Master in 1608. 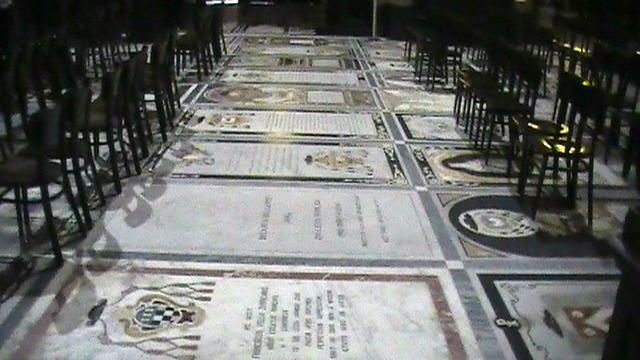 The inventiveness of tiling the floors with the marble tombstones of knights of old was impressive. Each marble tombstone had the individual fallen Knight’s body buried beneath it while on top, the personal history was engraved and etched into the marble giving an impression of inlaid patterned tiles. There are more than 300 of these marble slabs including the burial tombs of several former European princes. This is repeated in St. Paul's Cathedral in Mdina. A sensation of triumphant peace permeated the senses. There are intricately carved stone wall designs, as well as the painted vaulted ceiling and side altars with scenes from the life of St. John mostly done by Mattia Preti who also did the vaulted central nave with frescoes. Nearby is the domed Carmelita Basilica (seen below).